We invoke your mercy in humble prayer, O Lord, that you may cause us, your servants, corrected by penance and schooled by good works, to persevere sincerely in your commands and come safely to the paschal festivities. Through our Lord Jesus Christ, your Son, who lives and reigns with you in the unity of the Holy Spirit, one God, for ever and ever. "I am the light of the world. Whoever follows me will not walk in darkness, but will have the light of life (Jn 8:12)." Like the forty days' fast of the Ninevites, our Lent continues in complete confidence in divine mercy; but our hope is founded not so much on our poor efforts at penance but on the passion of our Savior. No one is excluded from the redemption effected by the Blood of Christ; His grace is promised to all who believe in Him. 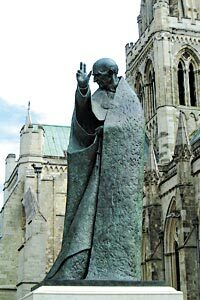 Historically today is the feast of St. Richard of Chichester also known as Richard de Wych, a saint canonized 1262 who was Bishop of Chichester. What do we do for the salvation of souls? It is true that we pray for one another, offer a few words of comfort, and do each other slight favors; but we do little more. Christ was more generous. He endured the crowning of thorns and dragged the heavy cross to Calvary. We pamper our bodies as if they were our last end. We prefer to have our heads crowned with laurels and roses. We are impatient and consider ourselves unfortunate whenever we are called on to carry a mere splinter of the cross of Christ. Are we one in spirit with Him? Now, during Passiontide, we must begin to love and treasure pain and suffering. In the cross, in suffering, in our crucifixion with Christ, we shall find salvation. For Him and with Him we should bear all the slight injustices committed against us. For Him we should suffer freely and willingly the unpleasant and disagreeable things that occur to us. But our faith is weak. We flee from the cross instead of holding it dear, instead of loving it and welcoming it as our Savior did. What St. Paul says of many Christians of his day is equally true of many in our time: "For many walk, of whom I have told you often (and now tell you weeping) that they are enemies of the cross of Christ. Whose end is destruction; whose God is their belly; whose glory is in their shame; who mind earthly things" (Phil. 3:18 f.). St Richard was born at the manor of Wiche, famous for its salt wells, four miles from Worcester, being second son to Richard and Alice de Wiche. In order to keep faithfully his baptismal vows, he from his infancy always manifested the utmost dislike to frivalous diversions, and ever held in the highest contempt all worldly pomp: instead of which his attention was wholly employed in establishing for himself a solid foundation of virtue and learning. Every opportunity of serving others he regarded as his happiness and gain. The unfortunate situation of his eldest brother’s affairs gave him an occasion of exercising his benevolent disposition. Richard condescended to become his brother’s servant, undertook the management of his farms, and by his industry and generosity effectually retrieved his brother’s previously distressed circumstances. Having completed this good work, he resumed at Paris those studies he had begun at Oxford, leading with two select companions a life of piety and mortification, generally contenting himself with coarse bread and simple water for his diet; except that on Sundays and on particular festivals he would, in condescendence to some visitors, allow himself a little meat or fish. Upon his return to England, he proceeded master of arts at Oxford, from whence he went to Bologna, in Italy, where he applied himself to the study of canon law, and was appointed public professor of that science. After having taught there a short time, he returned to Oxford, and, on account of his merit, was soon promoted to the dignity of chancellor in that university. St. Edmund, archbishop of Canterbury, having the happiness of gaining him for his diocese, appointed him his chancellor, and intrusted him with the chief direction of his archbishopric; and Richard was the faithful imitator of his patron’s piety and devotions. The principal use he made of his revenues was to employ them to charitable purposes, nor would he on any terms be prevailed on to accept the least present in the execution of his office as ecclesiastical judge. He accompanied his holy prelate in his banishment into France, and after his blessed death at Pontigni, retired into a convent of Dominican friars in Orleans. Having in that solitude employed his time in improving himself in theological studies, and received the order of priesthood, he returned to England to serve a private curacy, in the diocess of Canterbury. 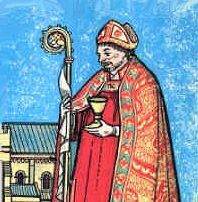 Boniface, who had succeeded St. Edmund in that metropolitan see, compelled him to resume his office of chancellor with the care of his whole diocese. Ralph Nevil, bishop of Chichester, dying in 1244, King Henry III recommended to that see an unworthy court favourite, called Robert Passelew: the archbishop and other prelates declared the person not qualified, and the presentation void, and preferred Richard de Wiche to that dignity. He was consecrated in 1245. But the king seized his temporalities, and the saint suffered many hardships and persecutions from him and his officers, during two years, till his majesty granted him a repreieve upon which he recovered his revenues, but much impaired. Having suffered a great loss by fire, instead of being more sparing in his charities, he said, “Perhaps God sent us this loss to punish our covetousness;” and ordered upon the spot more abundant alms to be given than usual. Such was the ardour of his devotion, that he lived as it were in the perpetual contemplation of heavenly things. He preached the word of God to his flock with that unction and success, which only an eminent spirit of prayer could produce. The affronts which he received, he always repaid with favours, and enmity with singular marks of charity. In maintaining discipline he was inflexible, especially in chastising crimes in the clergy: no intercession of the king, archbishop, and several other prelates could prevail with him to mitigate the punishment of a priest who had sinned against chastity. Yet penitent sinners he received with inexpressible tenderness and charity. Whilst he was employed in preaching a holy war against the Saracens, being commissioned thereto by the pope, he fell sick of a fever, foretold his own death, and prepared himself for it by the most melting ejaculations of divine love and thanksgiving. He died in an hospital at Dover, called God’s House, on the 3rd of April, in the year of our Lord 1253, of his episcopal dignity the ninth, of his age the fifty-sixth. His body was conveyed to Chichester, and interred before the altar which he himself had consecrated in his cathedral to the memory of St. Edmund. It was removed to a more honourable place in 1276, on the 16th of June, on which day our ancestors commemorated his translation. The fame of miraculous cures of paralytic and other distempers, and of three persons raised to life at his tomb, moved the pope to appoint commissaries to inquire into the truth of these reports, before whom many of these miracles were authentically proved upon the spot; and the saint was solemnly canonized by Urban IV. in 1262. After St. Paul's execution, his body was buried outside the walls of Rome on the road to Ostia. The first church built on this site was begun around 324. Because the original structure was so small and unable to accommodate the growing number of pilgrims, the church was rebuilt in 390. Despite much damage and restoration over the centuries, the current church looks similar as it was built in 390.